The Michigan football team doesn't open the season for almost five months, and remains committed to developing its younger players in the interim. That's par for the course this time of the year. Only, this year's opener is anything but par for the course, and the Wolverines can't help but peek toward their blockbuster matchup against defending national champion Alabama at Cowboys Stadium. "Everybody talks about it," senior safety Jordan Kovacs said Tuesday during a conference call with reporters. "That's a huge one for us to be opening with, and all the players are excited about it. Not many people get an opportunity to go to Dallas and play the defending national champs. We're really looking forward to it." The Wolverines return 15 starters from a team that won 11 games last season. Kovacs spearheads a secondary that could be the strength of the team, with seven of the top eight players back, including every starter. 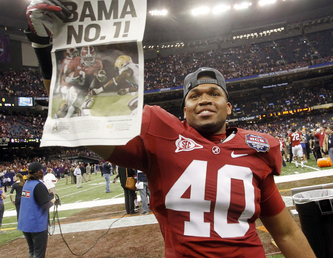 Alabama's DeMarcus DuBose celebrates after a 21-0 win over LSU in the BCS National Championship game. Next up for the Crimson Tide is a 2012 season-opener against Michigan. But there is uncertainty along the lines, where Michigan loses two starters from its offensive line (plus tight end Kevin Koger) and three from its defensive line. For coach Brady Hoke, that's been more of a concern than Alabama as the Wolverines wrap up their spring camp this week. "We're trying to get some young players being able to line up and being able to do the technique and fundamentals we want," Hoke said. "Obviously, we've talked about (the Alabama game) some. All of our guys are well aware we're going to play a great football team on Sept. 1. "We haven't just focused in on that game because of the other things we need to get done." Alabama went 12-1 last year en route to the national title. It is the first defending champ Michigan has opened against since it lost to Notre Dame, 24-19, to begin the 1989 season. The Crimson Tide, who hail from the powerful Southeastern Conference, opened as an early two-touchdown favorite against the Wolverines. Kovacs said Michigan isn't close to being ready to face Alabama, but also isn't frightened by the matchup. “It’s no secret the SEC has won, what, maybe the last six national champs,” Kovacs said. “It’s a very powerful conference, and we expect Alabama to be the best in that conference. That’s how we prepare. “But we’re just excited to be going into that game, and it’s going to be a real, true test of where we’re at and we feel like we’ve got a decent shot." Alabama has work to do before the game as well, as it replaces 15 of the 22 players who started in the title game against LSU. That includes seven on defense, where the Crimson Tide lose three of four defensive backs and three of four linebackers. They also run one of college football's most complicated defensive schemes, which will confound their rebuilding process. "There ain't no one who can learn that defense in under a year," outgoing Alabama free safety Mark Barron told AnnArbor.com last month at the NFL Scouting Combine. "I really don’t believe anyone can learn that defense in under a year." The Crimson Tide, like Michigan, know they will have their sport's spotlight on opening weekend, and are planning accordingly. Departing cornerback DeQuan Menzie said preparations already have begun for Sept. 1. "I mean, we had so much depth, it was crazy," Menzie said. "We're still going to be good. We'll start the season off right. Michigan better be ready." Thu, Apr 12, 2012 : 1:45 a.m. There is always a chance -- on any given Saturday upsets happen. That is why they play the games. We have DRob did anyone forget that... I was talking to a Georgia fan the other day and he said something about DRob that was compelling to me, he said that DRob never quits! That is so true... I would love to see Denard get the Heisman, he is such a great person too. I can see Denard running and passing all over Alabama. Alabama has this many starters returning, Michigan has that many...when all said and done we have Denard Robinson!! Wed, Apr 11, 2012 : 10:22 p.m. Seems hardly anyone is giving Michigan a chance versus Bama. I'm at a loss as to why, though. Yes, Bama is last year's national champ, but they are not the exact same team as last year. There are a lot of new faces filling positions on that team. Regardless of how talented they are, their youth and inexperience WILL play a major role. The good thing is that Michigan actually has a higher number of experienced players returning. If anything, the game should be pretty close. No need to roll over and capitulate to Bama merely because they are in the SEC or because they won a national championship. Let's go, Michigan, your destiny is in your hands! GO BLUE!!!!!! Wed, Apr 11, 2012 : 4:24 p.m.
As a reminder, Michigan Family, we are 20-6-1 against the SEC all-time. Wed, Apr 11, 2012 : 7:49 p.m.
Its funny, I seem to remember early 2008 when Michigan beat Cryer and Florida in the Cap One bowl. Last I checked... Florida is in the SEC and Cryer is the current coach of Ohio. Wed, Apr 11, 2012 : 7:48 p.m.
Ohio is something like 1-10 vs. the SEC... do...scratch that...their one &quot;win&quot; vs. Arkansas a couple years ago was called back on account of Tat$ and Ca$h. So...that would make Ohio something like 0-12 vs. the SEC.... so guys/women like Wrongmind do not really have a leg to stand on when they come here spouting off about how Michigan cant handle the SEC lol... look at yourself in the mirror Wrongmind... how can you lie so much? Wed, Apr 11, 2012 : 7:47 p.m.
A little off topic , but good one Ted. We have to let you win once every ten years or nobody is interested. Wed, Apr 11, 2012 : 6:43 p.m. Wed, Apr 11, 2012 : 5:22 p.m. If you want to talk about your past history against the SEC atleast make it relevant. What was that 2011 score against a .500 win sec team? Oh yeah, Miss St 52 vs Weasels 14. Wed, Apr 11, 2012 : 5:18 p.m.
That's just fantastic. Team 133 has never played against the SEC. What's your point? Wed, Apr 11, 2012 : 4:04 p.m.
Count down clock! Michigan has a chance to upset 'Bama - and that would echo through the entire season. If Appy State can beat Michigan, then Michigan can beat Alabama. Wed, Apr 11, 2012 : 4:23 p.m. Wed, Apr 11, 2012 : 2:36 p.m.
Alabama lost 15 starters. We lost 6 ( Wolfolk wasn't the best at any position by the end). Experience matters, and Michigan's starters from an 11-2 season have more than Alabama's players. If you think all that maters is talent than watch Boise State's 2 star recruits beat beat MSU in their opener. Borges just needs to call a great game and Denard needs to deliver. Sat, Apr 14, 2012 : 1:56 a.m.
And to think some people thought RR left the cupboard bare! Wed, Apr 11, 2012 : 1:24 p.m. I hear you on the season ticket sales ... On the game, I really don't think that defense will hold us to 7 points. We might give up 28 points, but we could potentially outscore them. Many players on that defense are new to the live action of a very complicated format ... we just might take advantage of that and end up winning 31-28 or something. All Michigan! Go Blue! Wed, Apr 11, 2012 : 12:03 p.m.
&quot;Michigan better be ready.&quot; I think they will. Will Alabama be ready? That's the question. I think Alabama will be in for more than they expect. Fri, Apr 13, 2012 : 9:34 a.m.
No doubt. We coming hard this year. GO BLUE!!! Wed, Apr 11, 2012 : 10:50 a.m. Wed, Apr 11, 2012 : 10:37 a.m.
Michigan 35 Bama 21 Mark it down. Fri, Apr 13, 2012 : 9:33 a.m. I'm with u all the way Steve. I live in Birmingham, AL. And we can definitely put up 35 against their defense. Its good, but not last year's good. Trent Richardson was in Walmart tonight.... I HATE BAMA!!!? GO BLUE!!! Wed, Apr 11, 2012 : 5:15 p.m. I've got it saved Steve. I'll be sure to get back to you after the game.